Nearly every topic that comes up on Fox News’ The Five tends to be discussed with the same lines; Bob Beckel versus everyone else. In fact, his “token Liberal” status has become one of the shows most entertaining running jokes (as well as occasionally being its biggest drawback) with Beckel providing quips like today’s “I accept my job here” whenever Eric Bolling and co. interrupt him. 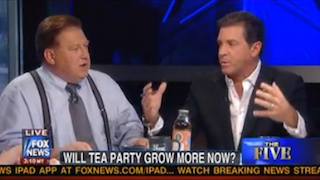 However, one topic puts Beckel and his co-hosts most at odds; the Tea Party. As such, it’s unsurprising that the topic has begun to get increasing air time on the show. Today, two segments were devoted to an increasingly heated exchange about Party. Early on, the conversation drifted to Vice President Joe Biden’s alleged insult of the Tea Party as “terrorists.” While the rest of the panel took it as given that Biden had made the remark, Beckel wanted to take the VP at his word. He did, however, acknowledge that he had called them that during yesterday’s show and, distinctly unlike when he called them “anarchists,” felt the need to apologize. That didn’t mean, though, that he didn’t have other things to say about them. Speaking as someone who grew up in New Jersey, I think Beckel owes us an apology. Of course, speaking as someone who went to college in New Jersey…yeah, that was a fair insult. The argument raged on even as Andrea Tantaros tried to corral things enough to throw to commercial.